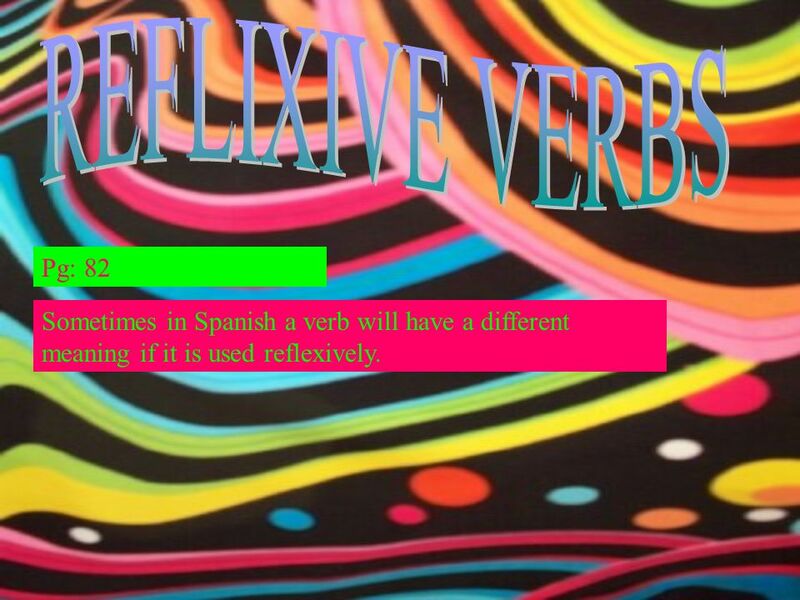 Pg: 82 Sometimes in Spanish a verb will have a different meaning if it is used reflexively. 1 Pg: 82 Sometimes in Spanish a verb will have a different meaning if it is used reflexively. 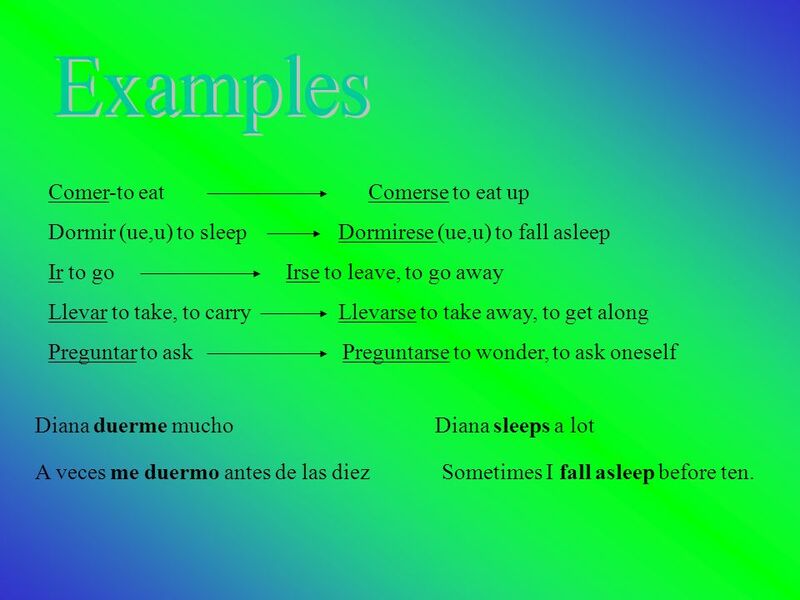 2 Comer-to eat Comerse to eat up Dormir (ue,u) to sleep Dormirese (ue,u) to fall asleep Ir to go Irse to leave, to go away Llevar to take, to carry Llevarse to take away, to get along Preguntar to ask Preguntarse to wonder, to ask oneself Diana duerme muchoDiana sleeps a lot A veces me duermo antes de las diez Sometimes I fall asleep before ten. 4 The verb caer(se) is regular in the present tense, except for the first-person singular form (me) caigo. 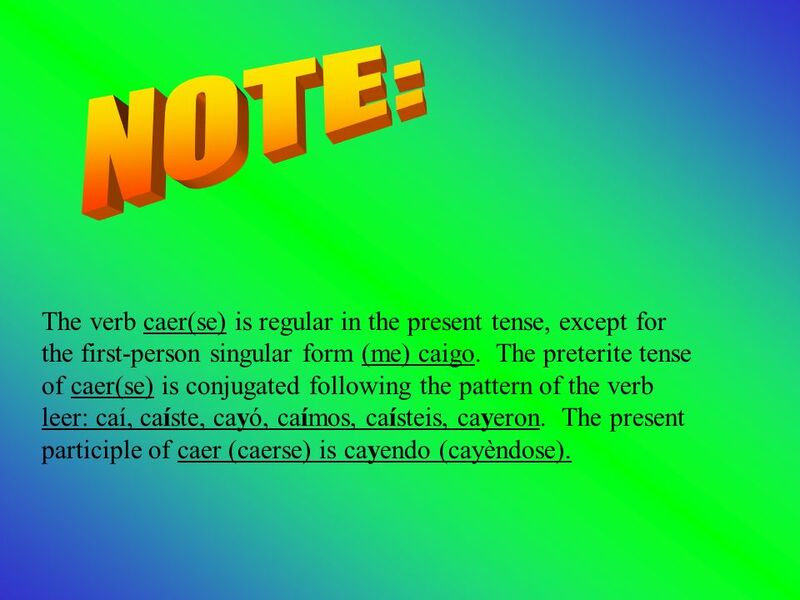 The preterite tense of caer(se) is conjugated following the pattern of the verb leer: caí, caíste, cayó, caímos, caísteis, cayeron. The present participle of caer (caerse) is cayendo (cayèndose). Download ppt "Pg: 82 Sometimes in Spanish a verb will have a different meaning if it is used reflexively." Estar en plena forma. el mar las mochilas y las botas correr El karate El gimnasio inscribirse El atletismo La natación el senderismo Las artes marciales. The Future Tense Year 12. 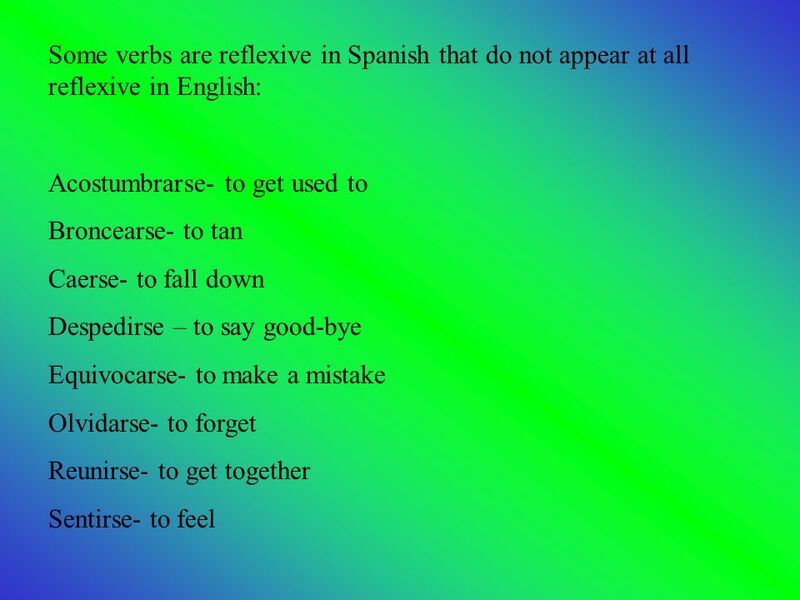 Otros usos de los verbos reflexivos A verb is reflexive in Spanish when the subject receives the action of the verb. In English this is implied. Stem Change Verbs O UE Leave me alone, I am trying to conjugate oue stem change verbs! ANTE TODO As you learned in Lección 6, –ar and –er stem-changing verbs in the present have no stem change in the preterite. The –ir stem-changing verbs. Repaso del pretérito el de enero. Tema 5-B Vocabulary : Un accidente el enfermero, la enfermera nurse. Study guide for Mid Term Test Yay!. Basic greetings Hola---Hello (If you get this wrong, 100 pushups.) Adios---Goodbye ʖCómo estás?---How are you? Estoy.